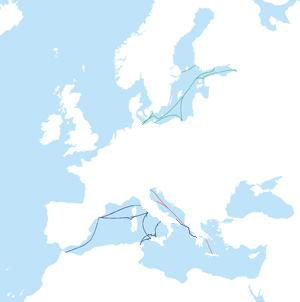 The Grimaldi Group offers a wide network of maritime links for passengers in the Mediterranean Sea (through Grimaldi Lines and Minoan Lines) and in the Baltic Sea (through Finnlines). The Group, aware of the need to offer more innovative, high quality and competitive services, deploys a fleet of modern cruise ferries, providing cruise ship standard facilities, and new generation Ro/Ro-Passenger ferries. All the Group's passenger ships combine excellent comfort on board with "low cost" formulas. Special attention is devoted to families, groups of friends and students, with fare reductions of up to 20% offered on all routes. In addition, great entertainment and fun events are organised on board the Grimaldi vessels.